Over the years, The Sign Depot has perfected the art of rust finishing signs using a custom finishing process. It is a multi-step paint finish that requires steady hand when it comes to achieving the distressed look required for each custom sign. This trend has since caught fire in the restaurant industry, changing the sleek chrome look to create more of a vintage look in many establishments. At a time where businesses are constantly looking to find ways to be unique, the distressed look rust finish trend gives restaurants a one of kind sign that helps them stand out from others in their industry. By using their signage as a focal point for the area, it attracts both current and potential customers to their locale and it serves as a 24 hour advertisement for their business. Below are four examples of restaurant signs that were given a distressed look by The Sign Depot. The sign for Kelowna British Columbia’s OAK + CRU Social Kitchen and Wine Bar is a mix of modern and vintage all in one sign. The juxtaposition between two eras in one sign was crafted through a mix of metal, rust and LEDs. It was created as welded metal sign box with cut outs for the letters. The sign was then fit for lit LEDs to light up the cut out areas. It was then given an all over rust finish creating a unique exterior showpiece for the local hot spot. 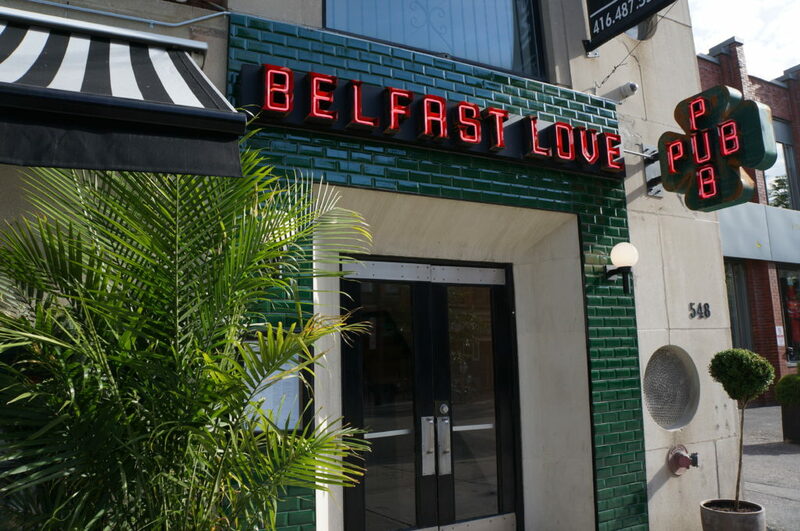 Belfast Love Public House in Toronto Ontario is branded as “A Proper Pub” and in turn required signage that reflected that statement. As a new restaurant in Toronto they knew they would have to get lots of eyes on their building and establish themselves as the top of mind place to be for traditional pub fare. This signage project required open can letters with neon tubing along with a paint and distressed finish to achieve authentic the look that the restaurant was going for. In this case the rust finish was strategically placed on the lit sign to create a patina look. For this project an exterior sign for the front entrance and a projection sign were created to catch the attention of both vehicle and foot traffic. The result is pub signage that looks like it’s straight out of Ireland. 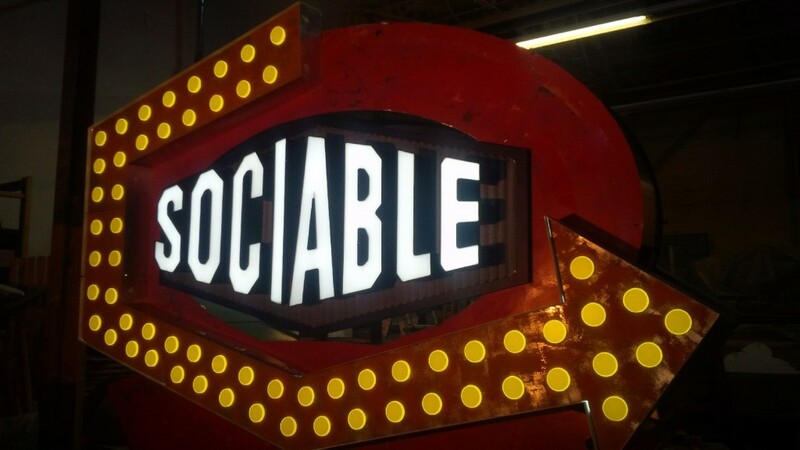 Retro is all the rage at Sociable Kitchen + Tavern’s Brantford Ontario location. So much so that their sign is actually a retrofit of sign that was already on the property. This multidimensional sign has several components to recreate the look of a vintage marquee sign. This project included refinishing the sign base to represent the look of an aged tin sign, LEDs faced with acrylic ovals to represent lit light bulbs, high density urethane that was CNC router cut to match the texture of a sea can shipping container, individual lit can letters for the restaurant name and a changeable message board to interact with their local clientele. The rust finish was the tie in that brought all of these items together. It created the retro look that Sociable Kitchen + Tavern wanted to achieve. Once combined, all these sign elements created a past meets present upcylced pylon sign that has quickly turned into a local landmark for the City of Brantford Ontario. In Las Vegas Nevada, the best way to stand out from all the flashing lights is to come up with something completely different. 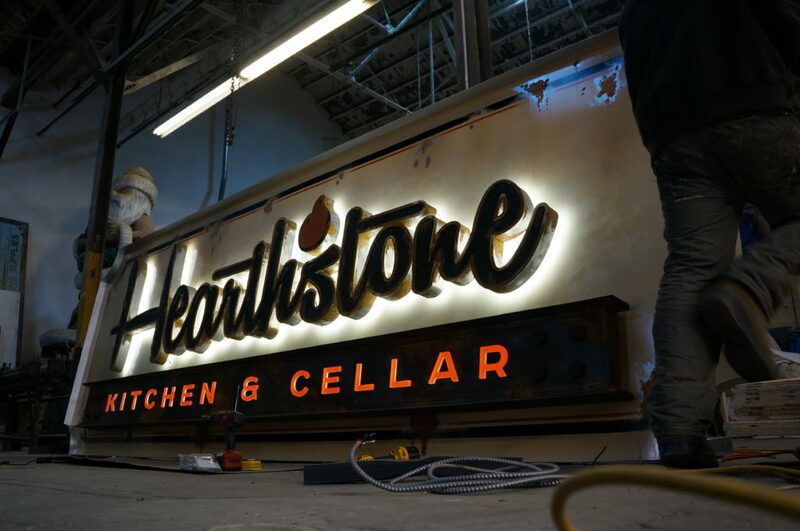 In this case, the Red Rock Casino Resort & Spa wanted to replicate the look of a salvaged Gaslight Sign for their Hearthstone Kitchen & Cellar restaurant. 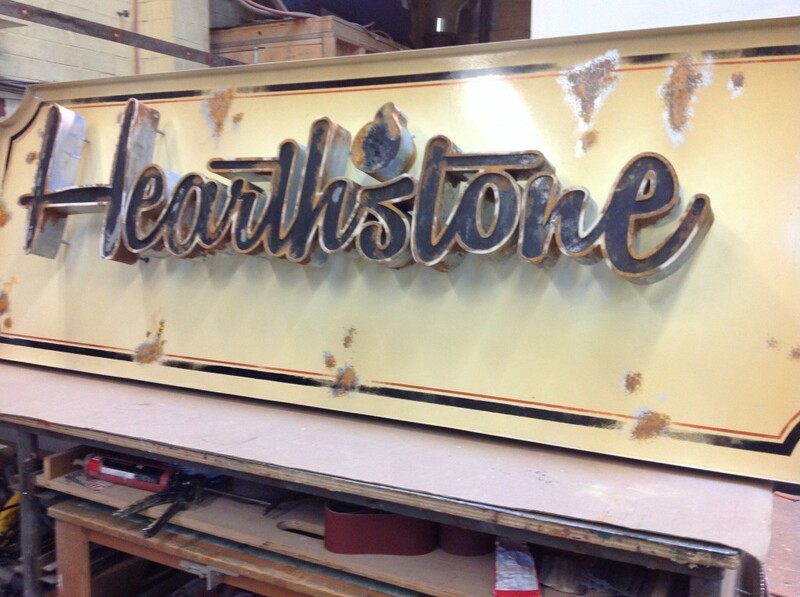 In order to recreate this look a three dimensional metal sign with can letters for the word Hearthstone was crafted. The letters were then halo lit with LEDs to give off a backlit glow to best replicate the hazy lighting of gaslight sign. Below the restaurant name, individual push through clear acrylic letters with the words Kitchen & Cellar were attached to let additional light from the LEDs shine through. After all of those components were in place, the distressed rust finish was applied to the sign base as well as the text and graphics on the sign. The addition of the rust finished suggested that the sign could have been a salvaged sign from the Las Vegas sign graveyard. As you can see from the images above, the rust finish on each sign is used differently depending on the style each restaurant wants to convey to the public. Finding the best fit for each establishment is something that the expert sign-makers at The Sign Depot specialize in. They can transform signage from being brand new to a very vintage look with various sign making techniques and paint finishes. 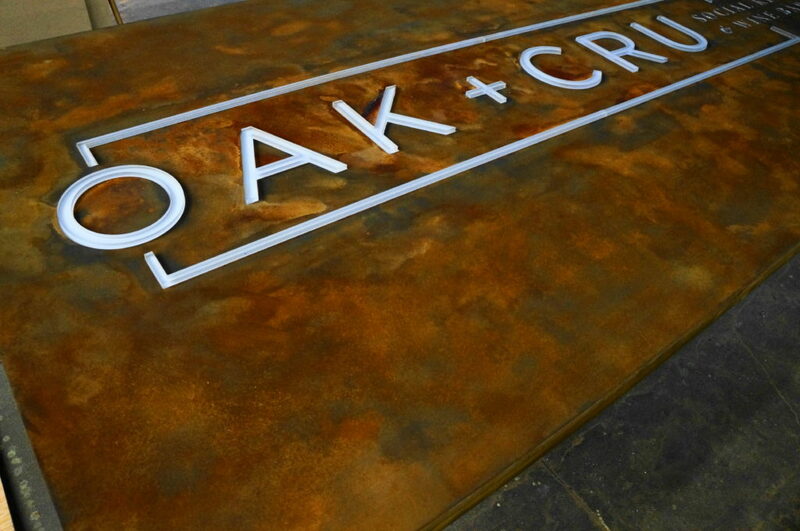 By choosing the distressed rust finish for these restaurants signs, it took bespoke signage to the next level. As a result of this, it makes each of the restaurant signs stand out showpieces that attract clientele to their establishments. These one of a kind signs show the public that they are in for a unique experience by choosing to dine there. or visit our CONTACT US page for custom quote.